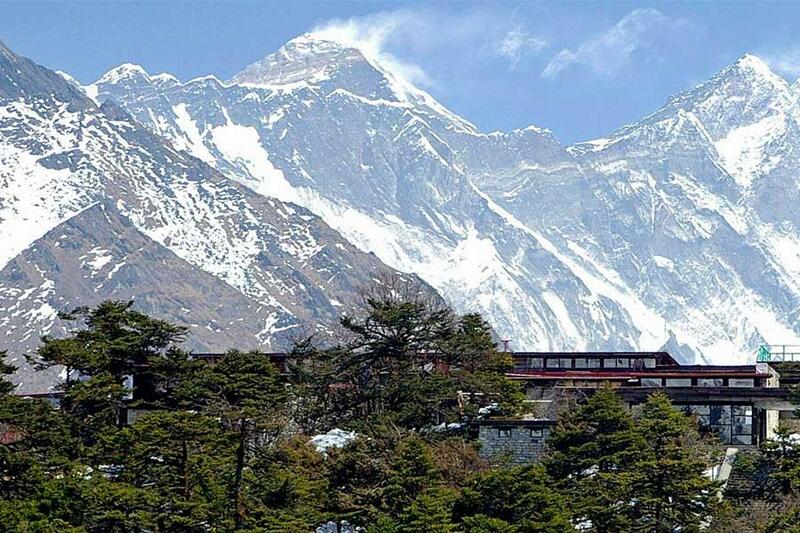 Luxury Nepal Tour Find the beauty and excellence of Nepal on this Nepal Luxury Travel. Investigate Kathmandu and medieval Bhaktapur with Luxury Nepal Tour. Dig into the rurality of life in the Kathmandu Valley. Witness an all encompassing Himalayan dawn and unwind in the sub tropical atmosphere of laid back Pokhara. Take a scenic mountain flight to see the great Mount Everest. This precisely arranged and thoroughly well thought out unhurried luxury tour through Nepal allows the guest the chance to experience Nepal in both a varied and captivating way, and while exploiting more luxurious housing you won’t feel expelled from the cultural soul of Nepal on this grand Himalayan adventure. Contact HimalayanTrekking, Today For More Information About Luxury Nepal Tour. Arrive at Tribhuwan International Airport in Kathmandu. Meet, welcome, assist by our representative & transfer to hotel. Welcome drink followed by tour briefing. Evening is free at your own leisure. Breakfast at the hotel and a private vehicle with driver will enable you to undertake a tour of the principle sights of Kathmandu. You’ll first visit the sacred Hindu site of Pashupatinath on the banks of the Bagmati River. Next you’ll head up to the massive Buddhist Stupa at Boudhanath, site of a Buddhist Stupa. Back into Kathmandu and to the Dwarikas owned Kaiser Cafe for lunch. In the afternoon your guide will take you on a walking tour of Kathmandu, including a visit to the Durbar Square. Late afternoon you’ll visit the Swayambhunath hill top above Kathmandu. Returning to Dwarikas there’s time to relax and take a dip in the swimming pool before being collected by private vehicle early evening and transported to the Bhanchha Ghar restaurant for an evening of traditional Nepalese food and culture. After dinner a private vehicle will return you to Dwarikas. Breakfast at Dwarika and you’ll be taken by private vehicle to the medieval city of Bhaktapur. The frenetic hullabaloo of Kathmandu is now behind you as the old part of Bhaktapur is essentially a pedestrian area. As well as exploring the temples and squares of Bhaktapur, your guide will also take you on a backstreets exploration of Bhaktapur. Take a leisurely lunch in Bhaktapur and afterwards you’ll be driven to the Nagarkot. 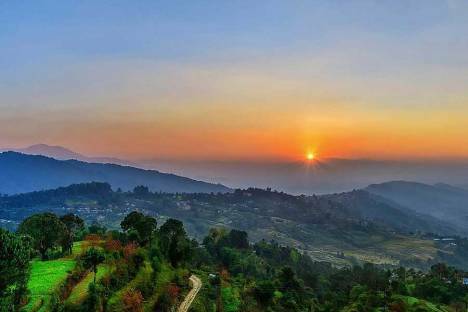 Early Morning, Enjoy the breathtaking Himalayan sunrise and after an early breakfast it’s down to the Kathmand airport and the short flight to Pokhara. You’ll be met upon arrival and driven by private vehicle to your lake side hotel set in a peaceful part of Pokhara. In the afternoon is free to enjoy the sun in one of Pokhara many laid back lake side cafes, or perhaps take a boat out onto the lake. Early evening a private vehicle will pick you up and take you to the Lakeside for dinner, returning after dinner to take you back to your hotel. A day devoted to leisure time in Nepal’s premier and more laid back tourist resort. Alternatively, if you prefer we can arrange activities visiting Davi’s fall, Cave, World Peace Stupa. 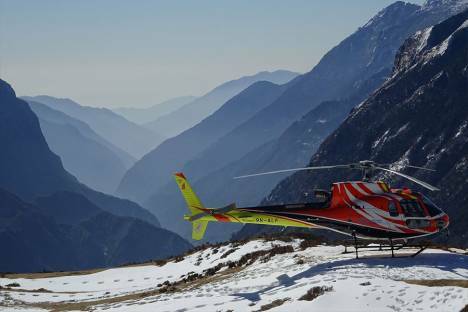 One interesting option for those wishing to get into the heart of the Himalayas would be to journey by private helicopter to PoonHill ( The best view point for close up views of Annapurna Himalayan giants. It is just a short flight from Pokhara to Kathmandu. Upon arrival you will be transferred by private vehicle to Dwarikas with the remainder of the day at leisure. An early start for the private transfer to the domestic terminal at Kathmandu Airport. Here you will board one of the dramatic Everest flight aircraft (window seat guaranteed) that once airborne follow the Himalayan chain before heading into the Khumbu region and towards Everest. As well as Everest you will see Ama Dablam, Lhotse and Gauri Shankar. For the ultimate experience we can arrange a private Helicopter to Everest Base Camp and landing at the Everest View Hotel in Namche Bazaar for breakfast!